That’s the question that popped up on my phone a couple of weeks ago. “Well, yes,” I thought to myself and clicked on the headline. 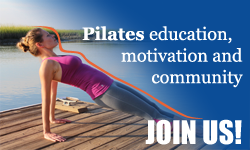 Another thought that ran through my mind while I was waiting on the page to load was “How do you, Google, know that I am into Pilates?” But that thought vanished almost instantly. Working in the web development I know the answer. Both Google and Facebook work tirelessly to aggregate data about our interests, what we like, where we go, what we are into. So here I was staring at a Google page that offered me to book Pilates classes at several local Pilates studios. If I was not happy with the Pilates results Google thoughtfully offered me several Yoga and Barre studios to book at as well. I have just entered the world of Reserve with Google. Since 2015 Google has been testing Reserve with Google – a service to book fitness and beauty appointments in local studios, spas and salons. Google has partnered up with major online booking/scheduling providers to offer this new feature. As of Fall 2017 Reserve with Google has gone mainstream in the US and Google has started prompting its users to check out the new service on their phones (that’s where the question “Into Pilates?” comes in.) If you are wondering whether this new feature can have a big impact on your Pilates business consider the fact that over 80% of all phones are Android (Google) powered. However Reserve with Google goes way beyond mobile usage. You can also book classes directly from Google maps (just click on the map listing for the business and navigate to Schedule), Google Search as well as from the Reserve with Google site. Another thought to consider is whether Reserve with Google will be one of the ranking factors for local businesses on Google Maps in the future. As of right now there is no proof or word from Google that it will have an impact however Google is constantly working on providing better experience for their users. Being able to book sessions and view pricing directly from the Google listing (without actually going to the website of the business) could be a major game changer in the future. In any case, Pilates studio owners should keep their business listings on Google up-to-date and utilize as many Google tools as possible: add announcements, promote studio events, add relevant business information, generate positive reviews and possibly integrate Reserve with Google. What do you have to do to get listed on Reserve with Google? Your studio must be using a scheduling solution that is one of Google Reserve Partners. As of right now MindBodyOnline powers the majority of Pilates studio bookings on Google. Other Google Reserve partners include: Appointy, Booksy, Pike13, Wellnessliving and several others. One of my personal favorite online booking providers Schedulicity is soon to become a Google Reserve Partner as well. How do you turn on Reserve with Google through MindBodyOnline? In order to be listed on the Reserve with Google page you must be active in the MindBody Network and have your studio listed on Google Maps. 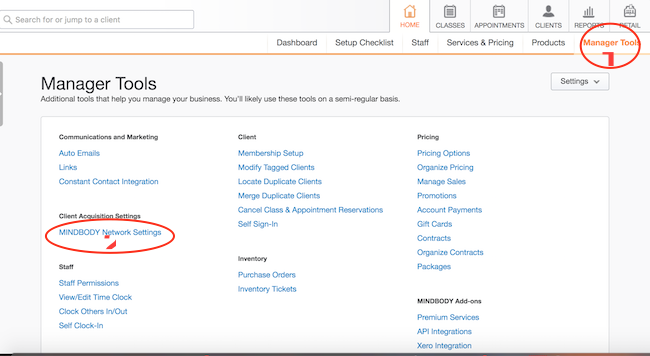 Log into your MindBody administrator account and navigate to Manager Tools in the top right corner. Under Client Acquisition Settings click on MindBody Network Settings. Choose “List My Classes” and click “Update.” In order for your classes to show up in Reserve with Google you must make sure that they are available for purchase online. Currently Reserve with Google is not available for Pilates appointments. 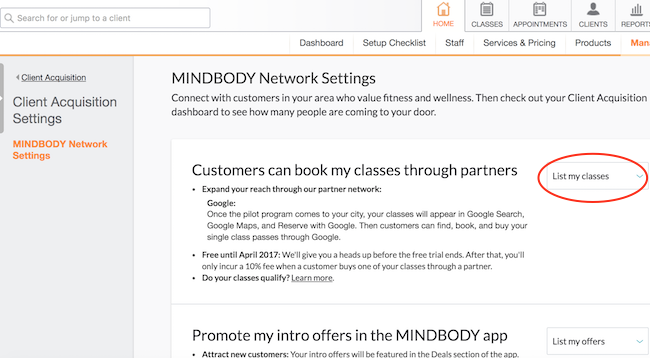 You can find detailed instructions as well as answers to most common questions about MindBody and Reserve with Google integration here. Important Step to set up restrictions for your classes. As a studio owner you might not want a brand new client signing up for an Advanced Level class at your studio. There is a work-around for it that will take a couple of steps to complete. You need to set up client prerequisites that will enable only certain clients to sign up for a class. 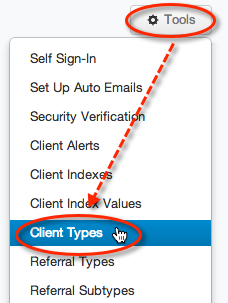 Navigate to Clients Tab in the main menu and choose Client Types in Tools. Type in the name of the new Client Type (e.g. Advanced or Current Client) and click Add New Client Type. Modify Profiles of all current clients to include the Client Type that you created.You can use Tagging feature to mass modify your client list. Add prerequisites to your current or new classes. For the classes that you want to make unavailable for Reserve with Google booking add a prerequisite in the Advanced Class Options. You will be able to choose a client-type that you have just created. These classes will either be unavailable for booking on Reserve with Google or will not let a new client sign up for this class without calling the studio. Read more about setting up restrictions for classes in MBO here. In the future you will need to assign the Client Type to every new client that comes to the studio to make all classes available for their booking. MindBody Online will collect a 10% commission on every class/package purchased through Reserve with Google however you do not need to pay any upfront fees for this integration. Any awesome feature will have its flaws, Reserve with Google is no different. No way to add class restrictions. UPDATE: Heather Erdmann has left a comment below that this drawback in MBO is not completely true. After digging through MBO options I did find a way to set up restrictions on classes based on Client pre-requisites (please view instructions above) however setting everything up will take some time. As of right now you can not set restrictions on which classes show up in Google schedule. So if you have an Advanced Pilates class on your schedule there is nothing that will stop John or Jane Smith who’ve never set a foot in the Pilates studio from booking themselves in. No appointments. Scheduling appointments is currently not supported by Reserve with Google and MindBody Integration. Available only in the US. Currently there is no international support for Reserve with Google and MBO integration. It is likely to change in the future. 10% fee. If you are looking for a completely free way to promote your classes then MindBody Network is not your choice. However, if you consider that you are paying ONLY 10% from the actual transaction for a new client then it’s not a bad deal at all. Of course if your clients decide that it is easier for them to pay for classes by searching for your studio on Google then you will have to incur the 10% commission every time that they do so. 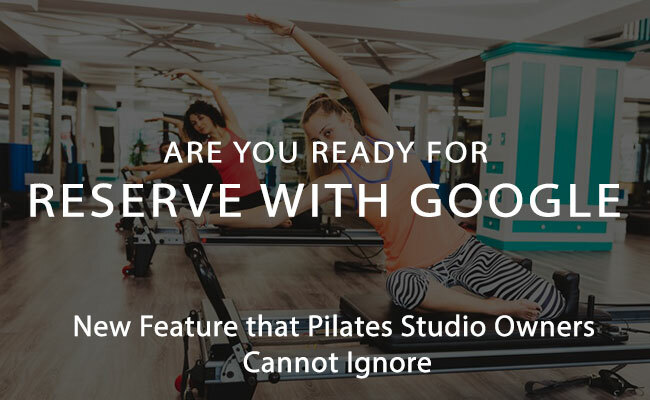 Should you use Reserve with Google for your Pilates Studio? There are several factors that you need to consider and as a business owner you need to make a decision. If you are already using MindBody Online (which is not everybody’s cup of tea, I know) then you should strongly consider this option to help market your studio and stand up to the competition. Personally, I would love to see more flexibility in the way that MBO and Reserve with Google integrate but we can hope that those changes are in the making. If studio growth is important to you then you cannot afford to sit on the sidelines. Don’t make the mistake of dismissing the importance of Reserve with Google. Keep a close watch on your competitors, research the best online scheduling solution for your business and keep moving forward. I just wanted to share that your first point in the drawbacks sections is not fully accurate – at least not when usin Mind Body Online as the booking software. If you have restrictions set up in your MBO, MBO calls them pre-requisites, then someone will not be able to book the class unless they meet your pre-set requirements. I’m not sure about other softwares. Maybe someone else has some insight there. Thank you Heather for the clarification. I looked at the options for client pre-requisites and I found a possible work-around. It’s definitely not very intuitive but can work. I have updated the article to include the workaround.